Since 2014 Goddard House has added a total of six 4ft by 8ft garden beds which stand at waist height and allows residents to garden from a standing or sitting position. 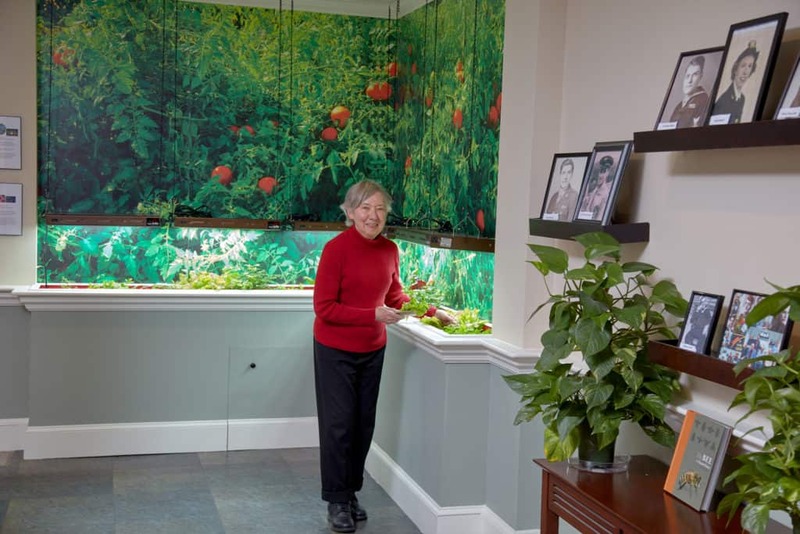 Not only do the garden beds provide another source of entertainment for our residents, but everything is harvested and served in the Dining Room. Our gardening program season with Green City Growers begins every year during the last week in March. A True Farm to Table Experience: Every Tuesday, residents work with a farmer to plant, grow, maintain and harvest a variety of vegetables and herbs. From tomatoes, onions and banana peppers to rosemary, mint, parsley and beyond! Last year alone we harvested over 200lbs of vegetables that were served through our dining room. Having an experienced and knowledgeable farmer along with 3ft tall garden beds helps bring back a favorite pastime! Although scientific research has yet to confirm this, we see the observable positive effects our chickens have on our residents here at Goddard House Assisted Living. Having farm animals here at Goddard House seems to have therapeutic calming effects on our residents and provides an ongoing activity adjacent to our beautiful garden patio. Collecting fresh eggs each morning, feeding and caring for the chickens has all become part of daily life here at Goddard House. 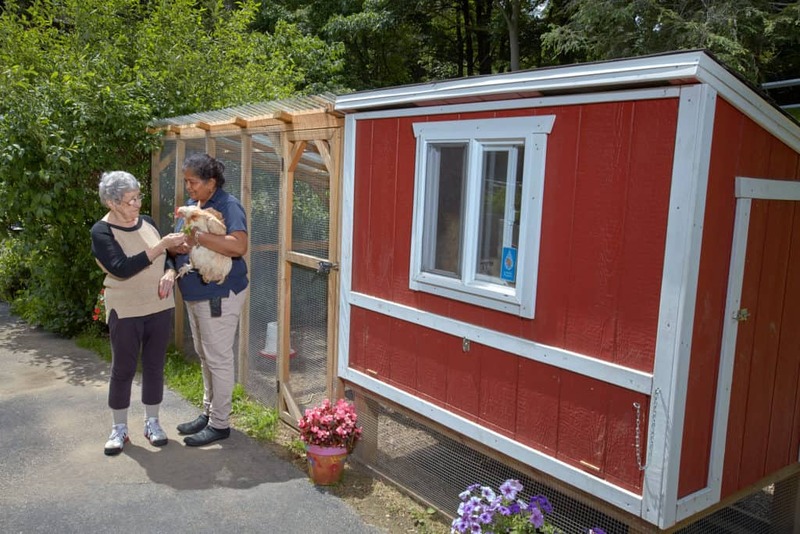 The chicken coop is situated along one of our walking paths and we’ve placed two park benches nearby so that residents can sit, observe and interact with the animals. It has been well-established over the past few years that Goddard House residents have some of the greenest thumbs in town. We’ve gotten a great deal of joy (and veggies!) from our outdoor gardens. In fact – if we had the choice, we would garden every day of the year! There has just been one little thing standing in our way: Mother Nature. Unfortunately, our gardening programs have had to be put on hold during the winter months. Well…not anymore! We worked with Green City Growers to install an indoor garden in our Palm Court. With the help of 24/7 sun lamps, we have a thriving collection of bok choy, mint, lettuce, cilantro, parsley, and chard. Every week, Green City Growers and our residents harvest the herbs to add a tasty touch to our dining menu. Aside from providing us with a pleasant taste of the outdoors, these indoor gardens afford us the opportunity to garden all year ‘round!